Use the dividers to organize large collections of CDs without the bulk of CD cases. Made from environmentally friendly matte polypropylene. Each divider sheet is pre-printed with one letter per sheet(except XYZ). 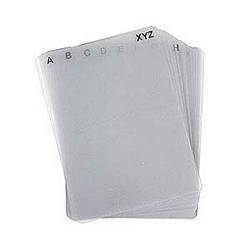 Simply turn upside down and use as blank dividers.